MIGINGO – Ugandan police on Thursday pulled down the Kenyan flag at Migingo Island in a further escalation of a conflict between the two countries over the mass of land in Lake Victoria. According to the Migingo beach management unit chairman, Mr John Obunge, the Ugandans decided to pull down the Kenyan flag even when the two countries had agreed to jointly man security on the island. “They pulled down the flag and warned the Kenyan police deployed on the island against making such attempts again. Our officers argued that the flag must always be hoisted at a police post but the Ugandans would not listen to them, Mr Obunge is quoted as saying by Daily Nation, a Kenyan print newspaper. Migori county police commandant Mr Joseph Nthenge said the Kenyan police officers at the island decided not to retaliate for the sake of peace. 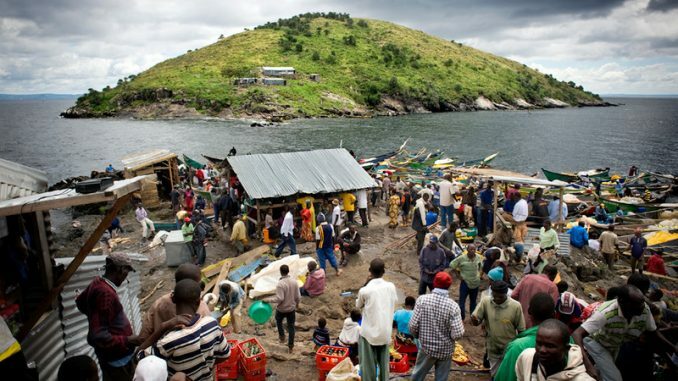 Uganda and Kenya have been in dispute over Migingo Island since 2004. So far, two joint technical survey teams have been set up since 2009 but none has been able to resolve the dispute. In 2016, Two Independent Electoral and Boundaries Commission (IEBC) registration clerks were arrested and their voter registration equipment impounded by Ugandan security officers manning the disputed Migingo Island in Lake Victoria. The clerks had gone to register Kenyan voters, mostly fishermen and traders who reside on the island. The fish-rich island is currently being co-managed by the Kenyan and Ugandan security officers. The Ugandan security team is estimated to number over 20, including those in plain clothes, while there are only 12 Kenyan officers. Senate Minority Leader James Orengo on Thursday said the Migingo row should be taken to the International Court of Justice (ICJ) for arbitration. The Siaya Senator said all colonial maps showed that the island belonged to Kenya. “The dispute has become an embarrassment to us and we must resolve it now using the goodwill created by the handshake between our two top leaders,” noted Mr Orengo. He said the international court has in the past handled territorial disputes of similar nature between other countries.